Children today are exposed to many languages at a young age. Through television, books, or even the grocery store. So it was no surprise that my five year old started showing an interest in speaking Spanish. Currently she knows a couple dozen Spanish words and can also count to 10 in Spanish. However, that only fueled her thirst to learn more. When I was asked to review a dual-language children's book I knew that I had to. The book is called Bosley Sees the World. It is the first book in a series of 'The Adventures of Bosley Bear'. Bosley Sees the World is about a little bear that discovers there is a whole world outside of his cave. From climbing a mountain to swimming in the river, Bosley takes on new and exciting challenges and he explores the world around him. The first time I read the book to my daughter I only read the English version. I wanted her to become familiar with the story before introducing any Spanish words. The second time I read the book, we went over each page, reading both versions. My daughter has read this book several times since then. She loves to read the English version herself then pick out certain words and ask me what the Spanish version of those words are. Throughout the book there are simple words that kids hear and use everyday. Both the English and Spanish version of these words have been highlighted. There is also a guide in the back of the book to further help parents translate these words. One thing I would like to see with this book is a CD or even a link to a webpage where kids can listen to the pronunciation of each word. Overall, Bosley Sees the World is an amazing book, but more importantly, my daughter loves it. Simple phrases and repeat words make this book easy to read and simple to understand. The book is geared toward toddler and pre-school age children. At this age, children are able to absorb a large amount of information making it the perfect time to introduce a new language. One thing I would like to see with this book is a CD or even a link to a webpage where kids can listen to the pronunciation of each word. 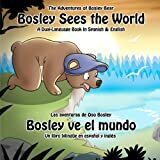 Currently Bosley's adventure is being sold in English, Spanish, German, French, Italian, Russian, Chinese and Arabic. If you are interested is in learning more about Bosley's Adventures click here. If you would like to purchase Bosley's Adventures click here or here. You can also follow Bosley's Adventures on twitter and facebook. I received no compensation for this review other than a free copy of the book. All of these opinions are 100% mine. I'm spanish & an english teacher, though I work as a flight attendant. In my experience, the best way to learn a language, besides living in the country, is by reading a lot. The first time I worked in the USA I didn't understand completely. Since then, most of the books I've read were in english. As I don't teach my contact with the language is very scarce, but now I could be considered bilingual. I also encourage learning throu movies and songs to acquire speed in speech. Very often I watch the movies in english with english subtitles, to relate the hearing with the spelling. Glad to hear you and your daughter enjoyed the book! Thank you for the kind words. Funny you should mention audio, I am putting together audio files for the book as we speak and will be making them available on the website.